I now have some more Finest Silvertip brushes made in ivory alternative which looks and feels like genuine ivory. They have a decent size "Chunky" handle. This is high quality cast polyester resin and has been used to restore furniture in English National Trust properties. It has a subtle grain pattern similar to real ivory and won't yellow over time. The brush handles have been individually lathe turned in the New Forest. There will be small variations in the shape and dimensions of each handle so each brush is unique. Here are some examples. The knot is 22 mm, handle height approx 54 mm and the loft 47mm mm. These brushes will are £35 plus £3 for worldwide delivery. They are outstanding value for brushes with the highest grades of badger hair and exceptional quality handles, all made by hand in England. Email NFB@padh.co.uk to confirm requirements, availability and payment arrangements. By "alternative" do you mean plastic? My supplier advised me that "alternative" ebony is better quality material than "faux" or "imitation" My woodturner told me that it is a very hard material - quite brittle to work with. But it is still a hard resin which some people describe as just a fancy term for plastic! I'll make some more enquiries about it and add further comments later. That alternative ebony handle looks lovely! "A specially cast polyester, perfect for machining, drilling, threading, boring and specialised turning. This polyester is used by the finest pen maufacturers in the world"
The alpalina sound interesting! Possibly quite Rooney like? Or would that be more like the Dovo Micarta Peter? I'll post some photos of my Alpalina brushes tomorrow. Hi Peter, that Alpalina brush looks pretty. Will they be available in Silver Tip and/or High Mountain Badger? Many thanks. If I can get some, High Mountain Badger will be used in some future New Forest local editions. Yes, I would love one of these in High Mountain. Will it be a Bulb or Fan shape head? It may be quite a while before I can get some more High Mountain hair - it's a seasonal thing. Bulb shape, fan shape - these are going to be assessed after I have tested samples in the coming weeks. 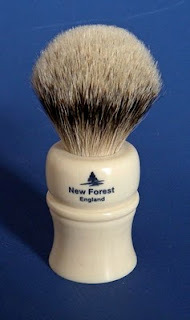 Hi, Fido I purchased the Finest Silvertip from you on Ebay the 5th of march, there's no Newforest Logo on the brush, is there any particular reason for this? When you bought the brush on Ebay, it was one of the last brushes I had without the logo. I didn't pick up my brushes with a logo until 8 March. That was the first time I was able to offer my locally made brushes with a logo. The brush you have is the one you bought on 5 March as per the photo on Ebay at the time. I don't recall saying that I would send one with a logo. Please let me know if you feel I did give that option. new2DE here from TSR. Just like to thank you again for the brush. I got it today and used it for my first DE shave ever and it was amazing! The brush was amazing - thank you for the recommendation. Thanks. Enjoy - and keep practicing!